These weapons look as good as they work. 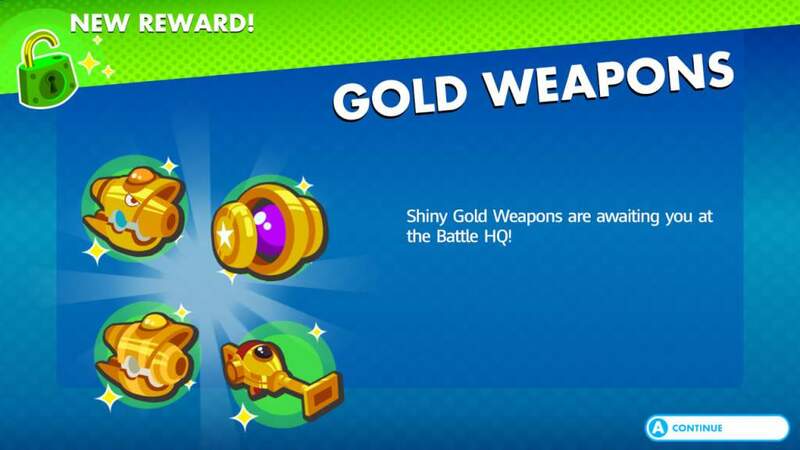 There's a wide berth of different weapons you can acquire in Mario + Rabbids Kingdom Battle, but there are only a few special weapons in the form of Gold Weapons. They're a powerful force to be reckoned with, and you can start collecting them as soon as you finish off the first boss in the game. It's a path you'll definitely want to travel down, as you'll want to collect as many of the Gold Weapons as you can. Here are some tips on how to acquire them as you move through the rest of the game. You'll want to make sure you level up your characters accordingly before going on the hunt for Gold Weapons, because some of them can be very difficult to obtain if you're still dwindling at lower level characters. You'll have to at the very least have the first boss encounter's Push ability, and from there you can head to the Ancient Gardens to travel to Area 4. There should be a a few bridges here with red switches. Go right at the red switches and then push the blocks here onto the switches so you can raise the bridge you need to cross over. Then look for the two bridges that move toward the center of the area. You should run into a few battles there, and then another switch to produce a bridge. Take out the boss Pirabbid Plant here in the secret area and engage in the rest of the matches to get special Gold Weapons. Gold Weapons will do additional damage, look awesome, and have a lot to offer both in terms of robust usage and glimmer and shine for your team. In short, you should make the journey to get them, even if it's a difficult one. They're powerful as such that they could turn the tide of battle if you use one.